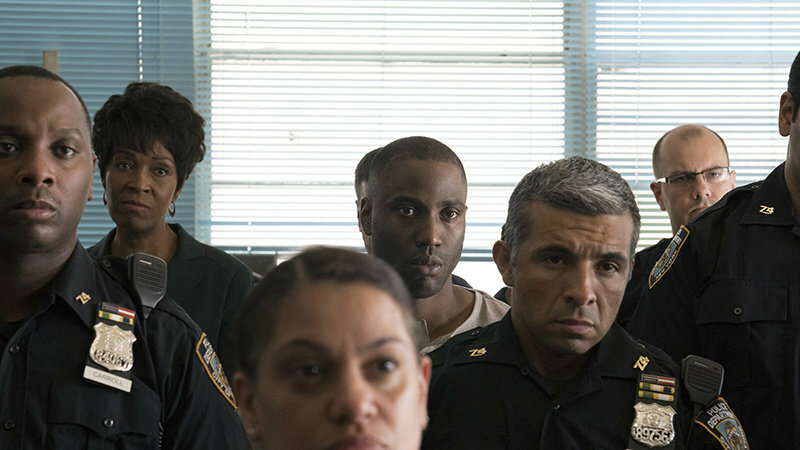 Monsters and Men Director Reinaldo Marcus Green's triptych narrative about a police shooting of an unarmed civilian takes viewers to that complicated place that occurs in a single moment: What should I do? 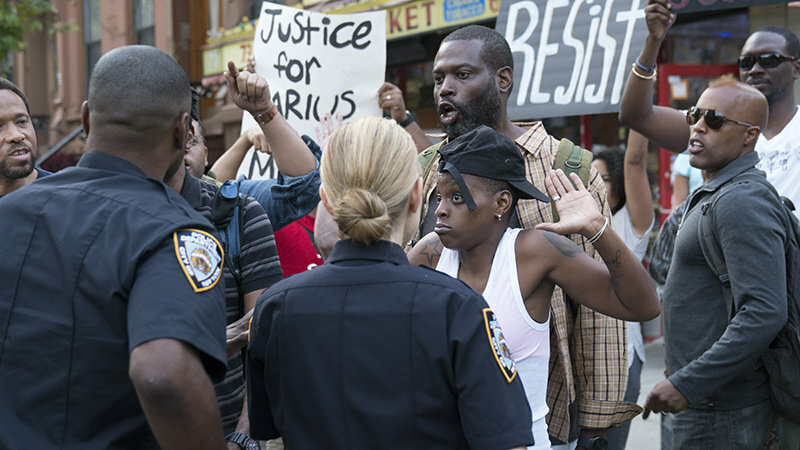 Reinaldo Marcus Green's Monsters and Men (2018) is a triptych narrative centred around the police shooting of Darius Larson (Samuel Edwards), which Manny (Anthony Ramos) witnesses and captures on his phone. 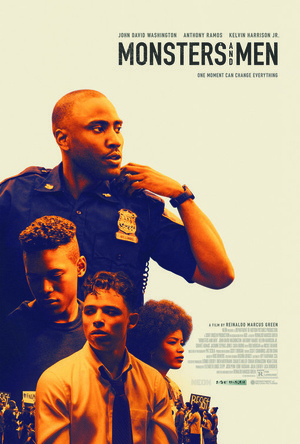 Creating a ripple-effect, African-American police officer Dennis (John David Washington) wrestles with his conscience over whether to stand up to detectives involved in the shooting, while talented local high school baseball prospect Zyrick (Kelvin Harrison Jr.) risks his future as he joins the activist cause. Prior to his directorial feature debut, Green collaborated with his brother Rashaad Ernesto Green on a number of short films. Stop (2015) about a boy stopped by the police on his way home from practice can be seen as a bridge between his short and feature filmmaking. The premise of the short foreshadowed a scene that would feature in Monsters and Men -- Zyrick is stopped and searched on his way home from practice by the police. A film drawn on from experiences Green encountered, he discusses with PopMatters the concept of "write what you know", and the emotional process of storytelling. He also reflects on his desire to not have Monsters and Men compared to other films, the influence of filmmaker Gus Van Sant, and his desire and the film's need for the audience to ask questions. Yes, just in terms of filmmaking as a medium because I have an older brother who is a filmmaker. So when I was working as a teacher, or when I was working on Wall Street, I had someone who was using their art to reach a larger audience and travel the world. I was inspired by him and his journey to venture into filmmaking, so I left my career on Wall Street to go to film school, and I think it was more of a process of self-discovery. I felt like I had this point in my life, at twenty-seven, when I needed a little bit more direction. I didn't know exactly what I wanted to do, but I knew that I wanted to express myself in a way that hadn't really been used in my twenties, or I hadn't used myself. So seeing my brother go out there and use art as a way to express his stories and our upbringing, and to then share that with people was really amazing to me. We grew up in a household where my dad watched tonnes of movies and listened to lots of music; it was a huge influence on our life. But he never pushed it on us as: Hey, go and make that or be the person behind it. So when my brother was able to take that jump, it inspired me. Monsters and Men I guess was born a very long time ago [laughs]; it was born the day I decided to go to film school. But in that process of telling my stories and reaching deep into who I am, of course you start thinking of what stories you can tell, and what are those things that are important to you. They always say write what you know, and Monsters and Men is something I knew a fair amount about. I grew up in Staten Island where Eric Garner was killed, and I grew up around a lot of police officers who are my friends, people that I have come to know very intimately, so much so that I have cast a few police officers in my short films. So I have had a relationship, a shorthand with many cops in my life and they're people that I admire and respect. The film takes place around a lot of situations I've encountered, or people that I know have encountered. And so the film was born out of those stories, those anecdotes of my childhood and adolescence that I felt like: Here we are today, 2018 in America, and we are still dealing with certain issues. I wanted to find a way to marry my upbringing with the things I was feeling very conscious about. And I felt that having gone to film school, making a film seemed to be the most appropriate way to address my feelings about it. The advice often given to writers is to write what you know, but there are different levels to this concept. I'd argue that writing about what you know refers to emotion, tapping into familiar feelings so the storytelling has an emotional authenticity, that can be felt by the actors and the audience. I one-hundred percent agree. Write what you know is pretty generic and I think write what you know is how you feel in certain situations. If I wrote a heist movie, I know nothing about robbing a bank, but I would know how I might feel in that situation. So it's constantly trying to put yourself in the shoes of the characters in which you are writing. I'm not a police officer, I have never spent one day in a uniform, and knowing lots of cops doesn't make me know anything about what it's like for one day on the job, but it feels like I maybe know how they speak. It's like I'm a fan of sports and if I go and root for my favourite team, I can know everything about them, but I don't know the first thing about what it's like being on the field. So there's that bridge I have to cross; it's that discovery and curiosity as a filmmaker or a screenwriter that you feel like you wanted to know, and you want to get as close to the field as possible. You may never get there, but you want to feel like: Oh, if I were an athlete this is how I would put myself in those shoes. So regardless of the genre and the situation, you are constantly trying to find ways to inject like you said, a believability of you and your character in those situations. It's constantly trying to tap into those personal details in these mediums. What struck me about your use of the camera in Monsters and Men is that it doesn't feel intrusive. Filmic storytelling can feel that way because of the camera and the choice of shots and how a scene is edited. When Dennis returns home and tells his wife to go to sleep, the camera just frames him as he silently stands there. While there are no words to communicate his thoughts and feelings, you can sense these. Silence can motivate an audience to be proactive in engaging on an emotional level with the character. In such moments we are entering the film, and yet we are aware of ourselves as being outside of it, a conflict that makes the experience all the more compelling. We talked a lot about what the audience sees, and much of it came down to conversations with [cinematographer] DP Patrick Scola about what do want to feel when we are in these situations? We don't have a tremendous amount of cutaways in the film and often times we do sit with a character. We just wanted to feel what they were feeling, as they were feeling it. Each character experiences the video, but we never see what the video is, and that might feel intrusive sometimes, but we feel what our characters are feeling about it, and so we stay with them in those moments. We breath with them and we allow the camera to just sit there, to look in the rearview mirror. Of course, when you are doing a triptych, naturally you have less time with each character, and we only had twenty-minutes. The attempt was to try to make you fall in love with each one of these characters, so much so that you forget the other one, you forget that you are following along, and you don't realise: Oh, we have just changed stories. So it was more about discussing those things, and of course we used a lot of wide lenses to get closer to the subjects, and that's how we were able to achieve it. ... [A] lot of it was just feeling it out, of how were we going to do this. We gravitated a lot towards handheld in certain moments, but then we still wanted it to feel graceful. The way I communicated with our DP was to talk about emotions and feelings, and what was the best way to capture that. So two words that permeated the most were we wanted it to feel graceful and elevated, and we wanted to fall in love with these characters. Those are the things we spoke about a lot when we started doing the shot list for the film, and they are ultimately what you see as the final product. Monsters and Men touches upon the idea of individuals being denied a future through injustice, and the risk of expressing a democratic right to protest. As emotional as it is, there's an intellectual aspect that heightens the emotional frustration, anger, and compassion we feel for these characters. This is a reflection of issues that are or should be a source of frustration within and also more broadly outside of American society. Again, this was a slight experiment. A subject matter that has obviously been tackled many different ways, we needed to be careful to to try not to be compared to other films. We needed to create our own path and to then try to find the best way to deal with this subject matter given the format. I knew I wanted to tell a triptych story, but what does that really mean? How do these stories relate? How do we all feel? What does it all add up to? That was obviously a big challenge trying to figure out how all these stories fit together, and then finding those moments that binds them. When Dennis is looking at Manny in the mirror and we linger on that, we're saying: Hey, I am you; you are me; I am Darius Larson. So that became this thing that we don't have to know each other, we don't have to be brothers or sisters literally living in the same house to have a deep emotional connection to someone else, to a passing stranger. All of a sudden we had this passing of the torch, this mirror reflection of subtle moments in the film, but hopefully we linger on them long enough for us to say: Oh, these two people maybe don't know each other, but they're looking at each other like they do know each other. Manny can't see Dennis on the other side of that glass, but he can feel him, and so there's this kinetic energy. There's this passing, a feeling that I am my brother, I am someone that can take on an emotional journey of someone else, without ever having really met them before. And so we played a lot with that in how we tried to connect these stories. It's not Crash (2004) and it's not Amores Perros (2000), although I appreciate and I value those films. They even became comparable to this film, but I didn't want them to be compared to that. Crash had been done and it won an Oscar, and taking the same format I felt Monsters and Men was going to feel different, like it was trying to be something that Crash wasn't. So I wanted to keep an original way to do this triptych structure. We weren't cutting to black between sections, we weren't using title cards, and so how were we going to do it? I saw Elephant (2003) by Gus Van Sant and I thought the way that he uses steady-cam and transitions from character to character, you are still in the same world, you are still dealing with one major subject matter and he's using five kids to tell this story. It was really powerful and it was obviously self-contained, taking place mainly in a school, and I thought: Can I do that? What can I centre this around? So in our film we have the Deli and the neighbourhood as a place that we keep coming back to -- that circle that we are all connected within. Dennis was at that Deli, Manny was at that Deli and Zyrick was at that Deli, so it comes full circle that way. We use the neighbourhood and these characters to say we are all connected in this environment, that we are all subjects by the colour of our skin to these issues that are happening in our community. Those were the things that were important for us in trying to tie this narrative together. Of course there were moments when we would have more inter-connections, if we felt we needed more, and look, some people might actually yearn for that. But I thought given the subject matter, given the truth of how most of these situations happen, they are not often tied in a bow. We don't often know what happens to characters like Manny, or we don't often know what happens to the police officer who has to keep quiet. That can go on for twenty years and there could be a series of things that happen. It could go on for an entire career that a police officer has to deal with issues like that, and so there is not one end point for a character like Dennis. But we tried to leave you at a moment where we feel that we at least understand the path that these characters are going down. A moviegoer might say: "Well what happened? Did Dennis lose his career or did he not?" I think it's more about the choice than the result of the choice, and that's how we decided to structure the film, and leave you with the choices as the end points in the movie. Choice and uncertainty go hand-in-hand; the unpredictability of cause and effect. The honesty of the film is that it doesn't try to control or say with any certainty what follows a choice. For example, Manny may eventually be freed through a campaign on his behalf, but we don't see this far into the future. There are ultimately choices made by others as well as our own that feeds into our fate, which the film explores. Exactly, and they're all the things that we were thinking about in making the film. And listen, like you said, maybe there's a part two, a campaign for Manny to get him out of this situation. We only have a finite amount of time to tell this story and we wanted to focus on those moments of injustice. We wanted to focus on those moments of choice and on those moments where we as an audience have an opportunity to do something. We see how difficult it is to make these choices, we see and we feel what it's like being in that situation for however long, fifteen, twenty minutes of each character. And maybe the hope by the end of the film is that we feel like we want to do something, whatever that means – an act of activism or an act of kindness. If that means holding the door for somebody behind you, those are the little things I feel like I am speaking to. It doesn't have to be a massive campaign for us to be better humans or to be more conscious, it's the little things, the small details. It's when the police officer stops you and introduces himself, rather than pats you down. I'm not saying that we are never going to have stops again, I think it's how we have those stops and how we interact with the community. They're going to happen and we are going to confront each other because these are situations that are going to be happening forever. It's how do we change the dynamic, how do we save lives in these instances versus taking lives? It's in these little moments -- we're talking split seconds -- that we can save lives, and so if we can slightly adjust our consciousness, we might be able to get to a higher plane of existence [laughs] amongst each other. I'm not saying we have to be best of friends, but there's that feeling of we need to do something in order to change the current situation, the current climate. I think that takes a little bit of empathy and it takes a little bit of consciousness on both sides. The film is conceived in a way in which you are positioning yourself to listen to both sides. The scene where Dennis and his wife have friends around is a good example of your allowing the voices of both sides to be expressed. On the one hand you have the criticism of the police, which Dennis responds to by explaining the realities of a domestic call, in which you may have a gun put to your head. What you capture is a sense of the friction of the us versus them mindset of an adversarial society. Exactly, and that's the thing. I felt like when I would talk to my police officer friends, or just being a civilian and going outside, I feel it's the Mets versus the Yankees. And listen, we're talking about human lives; this isn't Chelsea versus Man United. We can't view human life like a football match, we have to move into that grey area because it is complicated. 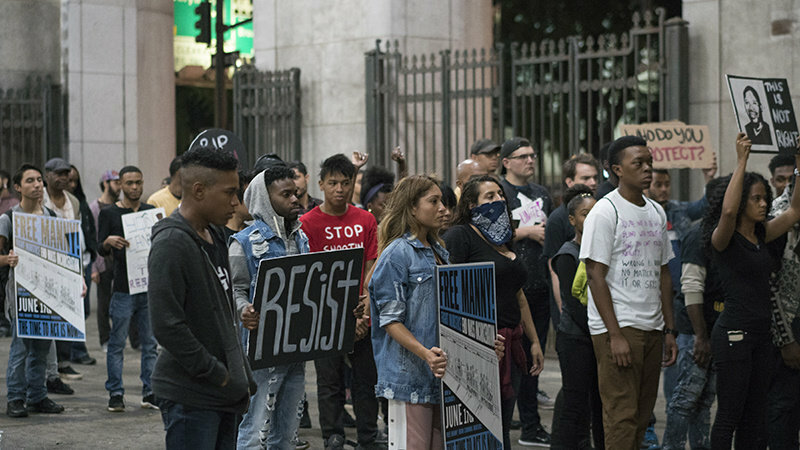 Again, we're talking about human lives that are at stake here, about real interactions with police, specifically unarmed black men and women that are dying at alarming rates at the hands of police officers in New York City, and around our country. We need to do something about that. We can't just say: "I'm on this team or I play for that team. I don't like them and they don't like us, and that's the way it's always going to be." Yeah, that may be the case, but I do feel that we have to start taking certain steps forward in order to change the results. If we continue to do the same thing, if we continue to act the same way, we are going to continue to get the same results. So we have to shake things up, we have to find ways to change policy and to engage community relations, and again, it can be a number of things and ways, and I'm sure that they are already doing it. But it's not happening fast enough, and I feel like art and music are ways that we can tap into the social consciousness of people, what they're thinking about and they are a way to express that. A lot of people don't have a platform or a means to tell their story, and to be able to share that this is what it's really like, to step into our world for just a little bit, maybe you'll understand. When you stop a young black kid for walking home, you could potentially ruin his life. It's not the same for a young white kid walking home because those things don't happen. These are the things the film tries to shed a little bit of light on, by again not necessarily taking sides, but also saying: "I don't condone these certain behaviours, I don't condone killing in any respect, on either side. I don't think that is the answer and we have to find a more peaceful way forward." Filmmaker Christoph Behl remarked to me: "You are evolving, and after the film, you are not the same person as you were before." Do you perceive there to be a transformative aspect to the creative process for you personally, and do you think the audience should be transformed by the experience of watching a film? You know it's a good question. Transformed might be a big word; I think inspired, motivated. There are some movies, of course, in my life that have left a lasting imprint. Was I transformed by them? I don't know. I think there are moments and lines in movies that I remember since I was a kid. They're certain moments that live on with me forever and questions I will have [memories] forever about certain movies, so I do think film has the ability to leave a lasting imprint. I don't know if Monsters and Men is specifically going to end racism and I don't think that was ever the goal. The intention was to shine this little light on things that often get swept under the rug. We know they happen all around us -- I'll use [the] Grenfell [fire] as an example. You turn on the TV and you see this tragedy, and it's horrific. Then you turn off the TV and you go back to your dinner. We do nothing about it because we feel like the problem is either too big, or it feels like someone else is going to handle it for us, and we just go back to our daily lives. Specifically with this film and police brutality, when you turn on the TV and these things are happening all around us, it's horrible, but then we go back to our lives. I just wanted the film to not go back to our lives for a second, I wanted it to feel like you're living with it beyond this film. Whether I achieved that or not, I don't know. I guess it's up to each audience member, and what they're left with. I don't know if it's an actionable item, or just: Man that was heavy. However, the visceral gut reaction of each audience member will be different, but the idea was that somebody would have a reaction; somebody would talk about it. Dialogue and conversation are at the heart of this film, and people are going to ask questions. I'd rather hanve questions than nothing, and to me if somebody wasn't a one-hundred percent clear on something, or wanted to know more, or was yearning to know about Manny, then in a weird way I did my job. If you're asking what happened to him at the end of the film, I love that question. I want you to ask what happened to him because I want us all to know what happened to Manny. That's the point of the film: what happened to him is what the film is trying to do. Let's not forget about the people whose lives are effected by these situations. There are lots of people like Manny out there, just sitting there, and no one knows what happened to them. They could be sitting in a prison somewhere and we have to do something about that; we have to rally and get behind them. So I hope the film sheds that little bit of light, and leaves a lingering feeling of hope, maybe, that folks can go out and try and find a way to come together, and do something.